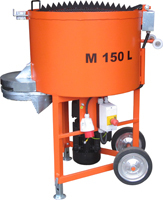 The ML 150 series of forced action mixers (pan mixers) mix dry, wet and moist mixtures. The MH series of pan mixers mix dry, wet and moist mixtures. The prime advantage compared with traditional drum mixtures is the fast and complete mixing of individual mixture elements. The ML 150 forced circulation mixture is recommended for mixing a wide range of construction substances, e.g. plasters, injection and rehabilitation mixtures, glues, wiping layers, concrete and walling mixtures (mortars), etc. A pan mixer functions on the principle of mixing blades rotating at high speeds around the axis of the static mixing tank. The mixing is done using three or four mixing blades which simultaneously wipe the mixture from the side and the whole bottom of the mixing vessel. The mixing blades are fitted with rubber wipers. Mixtures are filled through the screen in the mixture cap which is fitted with a tearing comb for balled mixtures. The mixed materials are discharged by turning the sliding segment on the bottom of the vessel.